You don't have to spend a million bucks to look like it. So remember how I got married back in September? Well we honeymooned in Asheville, NC and wouldn't you know but the J. Crew distribution center was about 10 minutes from our cabin. Al still thinks I planned that on purpose, but I swear I didn't. And what could be better than being 10 minutes from a J. Crew factory outlet? Oh being there the weekend they do their semi-annual warehouse sale! We stood in line for probably an hour (thank goodness it was mild out) and got to dig through boxes and boxes and boxes. I would have taken a pic but cameras weren't allowed. Al and I split up and started digging. We ended up finding more for him than for me (figures) but we scored some AMAZING deals. 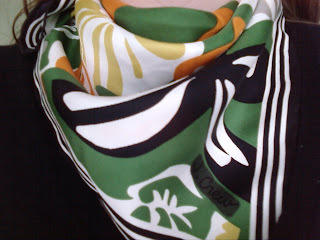 This silk scarf was $3! I also picked up a few headbands, some gloves, and a couple of hats. Al found sweaters and some ties. Their actual store is far more organized and I was able to find a top and a cardigan there. If you're ever in the Asheville, NC area, I highly recommend stopping by. The J. Crew distribution center and factory store are actually in Arden, NC but it's very easy to find and GPS-able. It's like any other outlet, hit or miss and usually off-season. They did have a nice selection of wedding and bridal party dresses. I don't remember the prices, but I do remember I wasn't bummed about missing out on a deal. I bought my wedding dress from J. Crew on clearance and it wasn't much more expensive than the outlet prices. If I can get my you-know-what together, I'll snap a couple pics of what we bought and the prices. I actually saved the receipts so I could report back! Closeup of scarf. 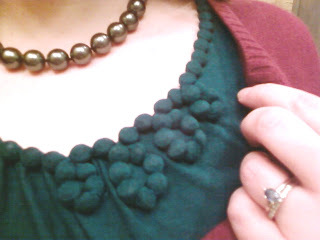 I just love these colors together and was tickled that it had black in it instead of brown. You usually find brown w/these colors and I'm just not a brown-wearing girl. Black hides the black dog fur better! Congratulations to Kameel/Totally Inspired at Mrs. Hall In Training for being our winner for the ShoesGotSole.come giveaway!! Kameel, thanks for being such a great blog buddy! Email me at cuteonthecheap at gmail dot com with your mailing/shipping info and your shoes will be on their way to you!! Thanks again for all who entered. Keep an eye out for more giveaways in the coming weeks!! Uniform Thursday AND a giveaway!! It's the little things that make us happiest, ya know? One of my favorite things is to check the mailbox at the end of the day. When I was little I would watch out the window for the mail to come and run out to get it. Even now, Al will skip checking the mail because he knows it's my favorite thing to do. Today's outfit is one of those little things too. 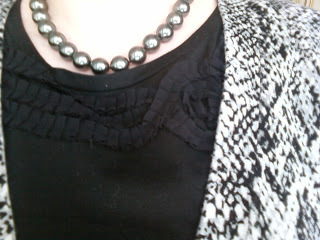 The pretty sparkly buttons on this cardigan really make it for me. I love the pretty deep pink color, but the jewel-like buttons really dress it up. I wish I had picked up another color (maybe black?) when Old Navy had these on sale a few months back. I had to jack up the colors a little as I'm still hobbling along using my cell phone camera. I have GOT to find my camera battery charger!! How cute is the decoration on this top? They feel like hard little buttons or something similar under the fabric. I snagged this for $6 on my last Target visit (when I got that cute black top for $3!). I heard on the news 49 states have had snow this year and I think we all are ready for something bright and shiny to perk us up. How about free shoes?! CSN Stores contacted me and is offering up a great pair of shoes to one of our readers. 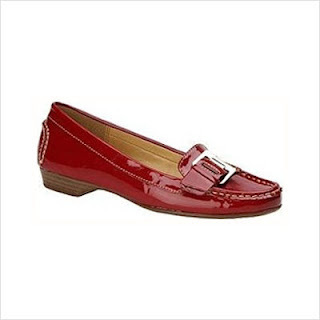 These great Naturalizer loafers are a bright red patent with silver hardware. They retail for $54 and they could be YOURS if you're the lucky winner. To enter the contest just leave a comment telling me what your favorite "little thing" is. You get one entry for your comment, one entry for Tweeting about the contest, one entry for blogging about it, and one for following us. Just leave a separate comment for each and a link if necessary. This contest is only open to US readers (sorry international gals!) and closes on 2/24/2010 at 11pm EST. I'm not going to even start complaining about all the snow we're getting, seeing as how the rest of the country seems to be getting WAY more than we are. However, HOLY CRAP. SNOW!!!! I scored this super cute tshirt at Target for $3 a couple of weeks ago. I am a sucker for plain, classic pieces and this was a great deal for such a nice design. How pretty is that ruffled flower? I'm going to keep an eye out for more "interesting" tshirts to wear under cardigans because I think this is MUCH dressier and special. Any big weekend plans with your sweetie? Al's promised me he'd finish our countertops this weekend. That's all the present I could ask for. Having a sink IN THE KITCHEN (and not washing dishes in the bath tub) and being able to cook w/out balancing dishes on the top of a yet-to-be-hung cabinet or in the toaster oven will be a real treat. 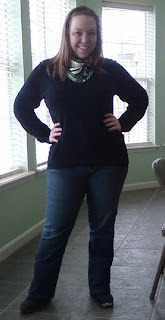 Happiness, Health, and Looking Fab!